Do I need both a mini and floor pump? How do I know if my pump will last? Bicycle pumps are an essential piece of equipment for any rider, whether casual or professional. They are useful for inflating not only tires but a wide range of sports balls and other objects too. Bike pumps vary greatly in price, size, and performance, and it can be challenging to decide which one suits your needs. Some are lightweight and portable – perfect for use on-the-go – while others focus on efficiency or pressure, and therefore may sacrifice compactness. There are even pumps which promise to offer all these features and more. To help you decide which pump to buy, this product guide compares the best bicycle pumps available and assesses their main features. 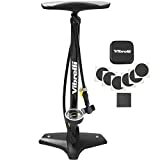 The Vibrelli Performance Bike Floor Pump is a great choice for both social and competitive use. The pump benefits from a “Rapid T-Valve” head meaning it can switch seamlessly between Presta and Schrader valves. A strong seal prevents leaks even at high PSI. A pocket-sized glueless puncture kit is included, making unexpected flat tires less of a worry. This versatile pump comes with needles for sports balls and inflatable devices, plus a storage clip. Built for precision, the gauge is accurate up to 160 PSI and has been designed for easy reading. The wide base is lightweight yet stable. + “Rapid T-Valve” for seamless switching. + Accurate gauge and large dial. + Glueless puncture kit included. 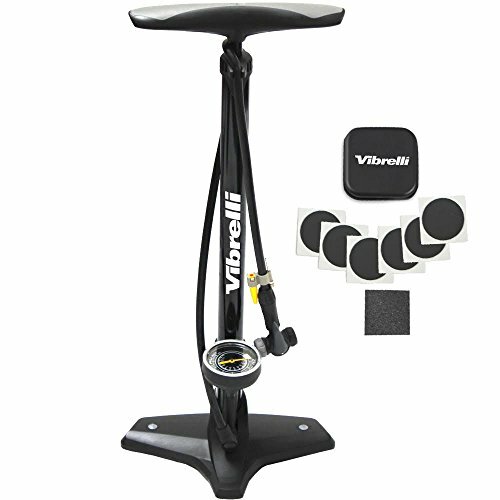 Why we like it – This bike pump is accurate, durable and easy to use thanks to Vibrelli’s “Rapid T-Valve” head. The pocket-sized emergency puncture kit is a useful addition to this efficient pump. 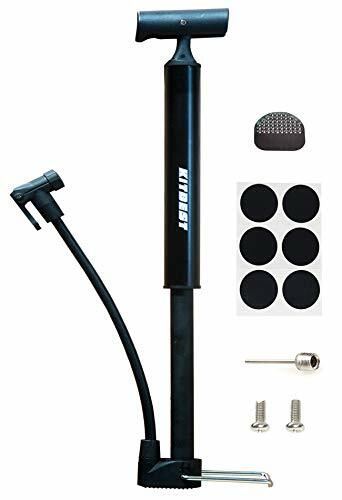 The BV Bicycle Ergonomic Bike Floor Pump benefits from a lockable twin valve design allowing you to switch between Presta and Schrader valves with ease. A long rubber hose with 360-degree pivot and an accurate, easy to read gauge featuring two different measurements made using this item simple. Featuring a long steel barrel, it allows you to pump your tires to a maximum of 160 PSI quickly. The oversized, ergonomically designed handle and stable base make this bike pump more comfortable to use. Added valves for sports balls and inflatable devices make this a versatile choice. + Long, pivotable hose for efficient pumping. + 1-year free replacement warranty. Why we like it – The ergonomic design of this bicycle pump makes it comfortable to use. It is easy and quick to pump up your tires thanks to the extra-long hose and strong barrel. 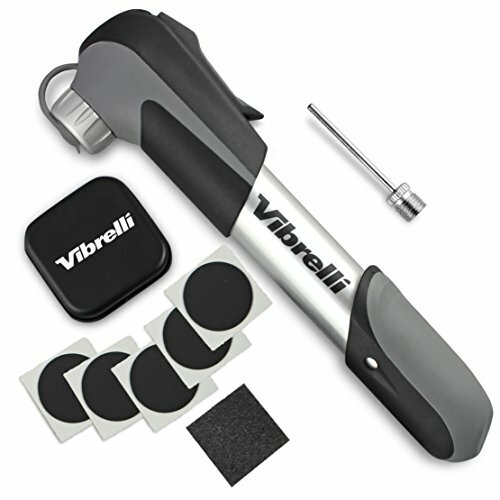 The Vibrelli Mini Bike Pump is a compact, light pump made of strong, durable aluminum alloy. It is fully compatible with both Presta and Schrader valves due to its leak-free “super fit” adapter. The extendable telescope design of this product allows adjustment for either faster or higher-pressure (up to 120 PSI) pumping, making this a versatile option. Easily take this pump with you on rides thanks to the useful inclusion of a compatible mounting bracket. The provided pocket-sized glueless puncture kit means you will never find yourself stranded due to an unexpected flat tire. + Included mounting bracket attaches the pump to your bike. + Glueless emergency puncture kit included. Why we like it – The compact size and useful mounting bracket make this bike pump a great option for on-the-go use, and the telescope design adds to its portability without sacrificing performance. This Veeca Mini Floor Bike Pump is a compact option made of durable aluminum alloy. Thanks to a clever dual pump head, this pump fits both Presta and Schrader valves with ease. It also comes with a handy needle for basketballs and other inflatable items. The foot-powered pump has the addition of a non-slip base for stable, skid-free usage. The base also contains hidden storage, which will appeal to on-the-go users. This Veeca bike pump is so lightweight you can simply put it in your backpack and travel without feeling weighed down. + Dual pump head with multiple valves. + Foot powered with anti-slip pad. + Made of tough aluminum alloy. + Hidden storage in base. Why we like it – The Veeca Mini Floor Bike Pump has been designed with portability in mind. It weighs little and is small enough to carry effortlessly in your cycling backpack without forgoing quality. 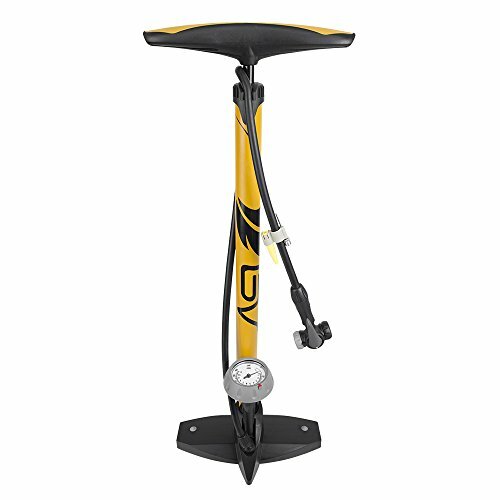 With a versatile yet sturdy design, the Schwinn Air Center Plus Floor Pump is a great choice for those after a reliable bicycle pump. This item comes with a useful dual pump head to fit both Schrader and Presta valves. Additionally, watch as the built-in indicator changes from red to green to help create a strong seal. The floor pump is stable and durable, with a wide metal base and high-volume, 21-inch-tall barrel to ensure quality performance. The design takes comfort into consideration with co-molded T-handle grips so you can pump tires up to 120 PSI with ease. + Dual head with handy indicator. + High volume barrel for easy inflation. + Handles designed for comfort. + Includes a sports ball needle and inflation cone. Why we like it – The Schwinn Air Center Plus Floor Pump is an accessible and durable item. The unique features of this pump, such as the convenient indicator, make it simple to use. 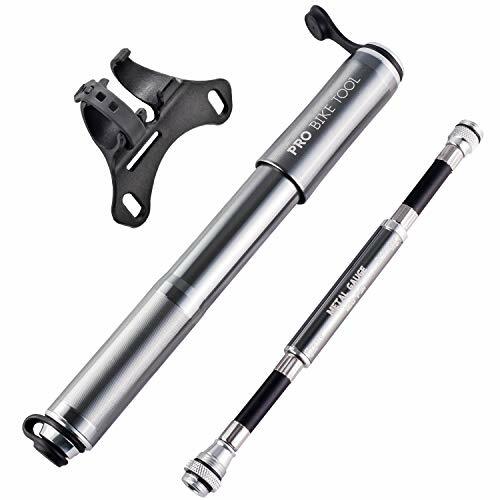 The Bell Air Attack Bicycle Pump is ideal for inflating wide tires, such as on a mountain or BMX bicycles. With a wide barrel, this item has been designed specifically to allow users to pump up their tires up to 100 PSI at a fast pace. If you prefer speed over ease of use, this is the pump for you. This pump fits both Schrader and Presta valves, thanks to a convertible head on the 350 and 450 models, or a dual pump head on the 650. The latter also includes a bottom mount gauge for precision. A ball needle and inflation cone are a bonus. + Good for wide tires. + Fits both Schrader and Presta valves. + Ball needle and inflation cone included. + 650 model includes a gauge. Why we like it – The Bell Air Attack Bicycle Pump has been created with speed as a priority, incorporating a wide barrel design. This makes it ideal for BMX and mountain bike users. The compact Kitbest Bike Pump is designed with both durability and portability in mind. Weighing only 200g, this pump can either fit effortlessly into your bag or be attached to your bike frame thanks to an included mounting bracket. This stylish aluminum product comes in three colors. With a range of bonus bicycle accessories including a glueless puncture repair kit and a needle for sports balls, this is a useful and versatile item which can pump up to a maximum capacity of 130 PSI. A reversible pump head allows for use with both Presta and Schrader valves. + Super portable, compact and light. + Includes mounting bracket for on-the-go use. + Range of bonus accessories including a puncture repair kit. + Made of durable aluminum. Why we like it – The Kitbest Bike Pump is a great choice for users who require a portable option. Weighing just 200g, this pump can be easily carried with you wherever you go. The award-winning Pro Bike Tool Bike Pump with Gauge is a great all-rounder. Promising speedy and accurate inflation, this pump reaches riding pressure with 30% fewer strokes than conventional mini bicycle pumps. At 4.5oz, this product is super compact, with the flexible air hose stored inside the handle. A handy frame mount bracket is included. An integrated pressure gauge ensures precise inflation. Made of quality aluminum alloy and available in a range of colors, the pump is both stylish and durable. It is compatible with both Presta and Schrader valves and the secure design means no more air leaks. + Unique stylish and durable design. + Secure design for reduced air leaks. + Weighs just 4.5oz for increased portability. + Integrated pressure gauge for accuracy. Why we like it – The Pro Bike Tool Bike Pump with Gauge is a unique and stylish pump. It is highly portable and has some interesting features making for efficient and accurate inflation. 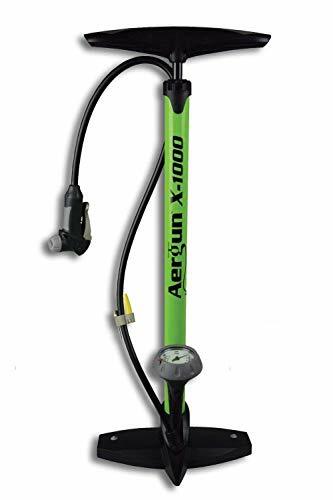 The AerGun X-1000 Bike Pump allows you to effortlessly inflate tires up to 160 PSI. This high-pressure pump is powerful and of superior quality. It is the unique high-class pump head which results in efficient and accurate inflation, and seamless compatibility with both Schrader and Presta valves. The pressure release valve allows speedy and precise air removal, making this versatile product particularly suitable for those who practice different types of training or riding. A gauge with an adjustable indicator makes results easy to read. Other advantages include a lengthy, flexible hose, a wide handle, and additional needles. + Inflates up to 160 PSI. + High quality, tight seal pump head. + No need for adaptors or switching. + Made of heavy-duty materials. + Designed for high-performance bikes. Why we like it – The AerGun X-1000 is big on quality and promises superior performance. Its most unique feature is the easy-to-use, versatile pump head. High-performance bicycle users can confidently use this bike pump. 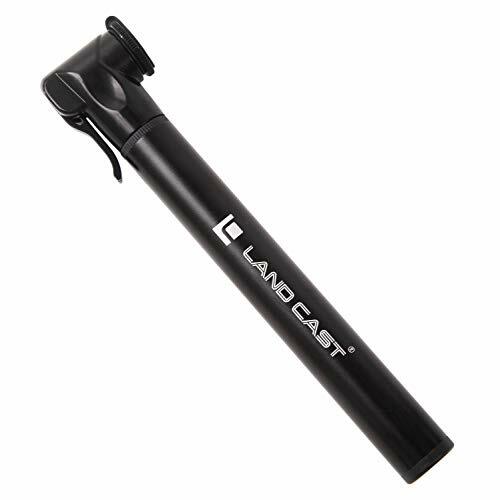 The LAND CASE Mini Bike Pump is a compact yet powerful product. With an impressive maximum pressure of 300 PSI, it is astonishing that it is so light and easy to use. This is thanks to its patented dual chamber technology, which reduces inflation time by up to 20%. 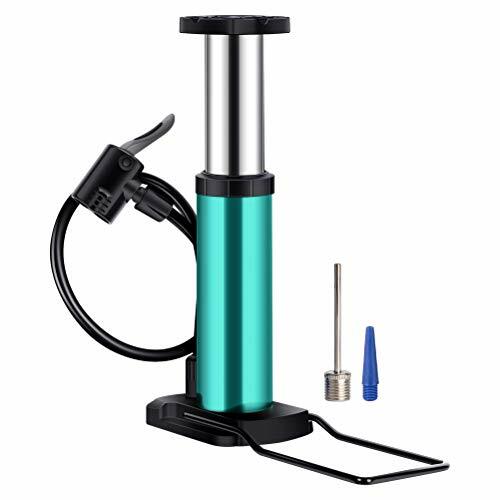 This compact bike pump is made of 6063 aluminum alloy, the type often used in airplanes, so you can expect a durable yet portable piece of equipment. It is also compatible with both Presta and Schrader valves, without the need for an adapter. + Frame mount bracket included. + Made of durable material. + Patented technology for faster inflation. Why we like it – The unique dual-chamber technology is what makes the LAND CASE Mini Bike Pump a great choice. High pressure and efficient usage are possible even in a compact pump. A floor pump is essential for any cyclist. They are freestanding, with a wide base and a plunger which should allow you to inflate your tires comfortably. Features of floor pumps include a flexible hose for ease of use and a pressure gauge displaying PSI for accuracy. A large chamber allows for speedy, effective performance. This type of pump is not typically portable and therefore is best kept at home. However, floor pumps have a greater volume and will reach high pressures without requiring as much time or effort as a mini pump, making them a vital item for any rider. An accurate, readable gauge is essential to any good floor pump. Factors such as comfort, ergonomics, maximum pressure and precision should be considered when buying a floor pump. A mini or hand pump is a good piece of equipment to have for on-the-go inflation. Nobody wants to get a puncture while out and about, but when an emergency strikes, this item can save the day. Many come with a handy mount bracket to attach to your bike frame, although most are small and light enough to fit in your backpack or basket. You may need to use more effort to reach a suitable tire pressure using a mini pump than a floor pump, as their smaller size means less volume. Furthermore, a mini pump will not typically reach optimum tire pressures but should do the trick until you get home. Some come with a hose, but many simply attach to the valve directly without any extra effort required. Overall, this style of pump is invaluable in an emergency or to make minor pressure adjustments. The two main types of valve are Presta and Schrader. The Schrader is the wider of the two, and is a uniform circumference all the way down, with a pin in the center to adjust the air. This type of valve can often be seen on car tires and mountain bike or fitness bike tires, as well as tires on children’s bikes. Usually, a wider tire indicates a Schrader valve. A Presta valve is more likely to be seen on road or performance bicycles and can hold higher pressures. This type of valve can be identified by its graduated appearance with a removable nut on the end for adjustments. Dunlop valves are also used but are less common. They are similar in appearance to a Presta valve but are wider. Because they are rarer, if you use tires with this type of valve, ensure that whichever pump you buy is compatible with Dunlop valves. The majority of bike pumps on the market today are compatible with both Schrader and Presta valves, using different technologies to achieve this. Some pumps use dual or twin heads with two separate gaskets for each valve type. Others are simply adjustable, fitting both common types of the valve without any extra effort. It is common for modern pumps to also include needles and other adapters to inflate sports balls, pool floats, and other inflatable items. Floor pumps often include a clip with these for easy storage. A floor pump is without a doubt a vital piece of kit. However, while a floor pump is an important and effective tool, you will not typically be able to take it on rides with you. Conversely, while a mini pump is a great portable piece of equipment you will be glad to have in a predicament, it may not match the performance of a floor pump in terms of factors such as volume and accuracy. Therefore, it is advisable to cover all bases and invest in a floor pump to keep at home as well as a mini pump to take on the road. However, some modern pumps claim to reach high PSI with relative ease, while still being super compact. Many of the bike pumps in our buyer’s guide are made of durable steel or aluminum alloy. It may be worth investing in a more expensive pump made of metal than opting for a cheaper pump with lots of plastic parts, as the former may save you money in the long run because it will likely be more durable. Do not worry about forgoing quality for transportability, as mini pumps are often made of hard-wearing metals despite their compact size and low weight. Optimum tire pressure is important for smooth, speedy cycling. Furthermore, unsuitable pressure can result in annoying and dangerous flat tires. Narrow tires usually require more pressure than wide tires. Ensure that whichever pump you choose can reach your required PSI. The inclusion of an accurate and precise gauge – a must for any good floor pump – can help you achieve ideal pressure. In conclusion, there are many factors to take into account when purchasing a bike pump. Floor and mini pumps are both useful pieces of equipment in their own ways, and many cyclists find it beneficial to have both. It is also useful to think about the type of tires you have when choosing a pump, as varying types can require different amounts of pressure. It is important to note the type of valve your tires have and ensure you opt for a suitable pump. Remember that many modern pumps are suitable for both Schrader and Presta valves. 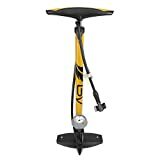 Overall, there is an impressive range of bike pumps on the market today utilizing modern technologies to make your life easier. Hopefully, this guide will help you to choose one with the features you require.